Blocked and unbalanced energy in your pet can lead to increased stress and illness. Reiki works by bringing about a deep relaxation response. By increasing relaxation, Reiki promotes healing while decreasing stress, pain, and anxiety in your animal companions. Reiki can be offered in-person or from a distance so your pet can receive Reiki in their homes or where ever they feel comfortable and safe. This facilitates helping pets enter into a deep relaxation space where innate healing begins. Animals, no matter their species, intuitively trust, understand and respond to Reiki. Animals with behaviorally-based issues like reducing fear, anxiety, aggression, depression can benefit from regular Reiki treatments. Holistic by nature, offering on-going Reiki treatments promotes balance and harmony in your pet's life. When pets feel peaceful it adds to their happiness. Offering Reiki when you're on vacation or go out of town helps your animal family to stay calm and relaxed. It also reinforces to them that you're always connected to them and will return home. Surgery and other veterinarian procedures can be stressful for your pet. Reiki supports your animal by helping them to stay calm and relaxed. Regular Reiki treatments help pets cope and deal with acute and chronic illnesses. Reiki supports animals who are in hospice care and throughout the dying process. All species, including those who have returned home to Spirit, benefit from receiving Reiki. Of course, there are many more benefits to regular Animal Reiki treatments besides the ones I mentioned. Interested in learning more about Animal Reiki? **Disclaimer: Animal Reiki is never a substitute for veterinarian care. If you feel your pet isn't well, contact your veterinarian immediately. Being a caregiver for your pet, no matter what their age, is challenging physically, emotionally, mentally and spiritually. It's exhausting taking care of your senior animal, even though you're happy to love and support your senior friend. Caregiving sometimes creates feelings that may surprise you including frustration, anxiety, anger and even guilt. Talking with your pet can give your insight, support, and guidance in ways that may be totally unexpected yet welcomed. Lisa Spector, creator of the music and sound therapy series Through A Dog's Ear and Through A Cat's Ear, recently reached out to me for guidance when she was feeling guilty about leaving her senior dog, Sanchez. Here is Lisa's guest post about her experience talking with Sanchez and how it helped alleviate her guilt about leaving him. My 13 and 1/2-year-old yellow Lab, Sanchez, has been recovering from an E. coli infection. It was touch and go for awhile. While I was waiting for his lab results to come back after a few weeks of treatment, I didn’t know whether he just needed a diet change or if it was to be our final days together. I was on a complete emotional roller coaster. Truthfully, his care was really hard. I didn’t know how much more I could endure of making all of his meals, giving him subcutaneous fluids daily, and barely leaving the house in case he needed my help. I had already decided I wouldn’t take any measures to prolong his life if his quality of life wasn’t likely to improve. But, I had to figure out how to get myself off of this emotional roller coaster. I was trying to communicate with Sanchez to find out what he really wanted, but I felt too unsteady like I was on rocky ground. I wasn’t trusting myself. 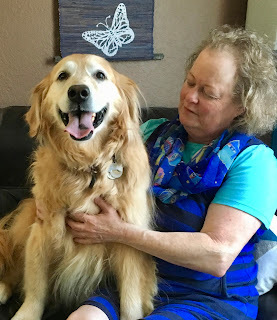 I decided to reach out to Animal Communicator, Cathy Malkin, whom I've known since taking her beginning level animal communication class when Sanchez was a young dog. In all honesty, I hadn’t considered my quality of life. Caring for senior dogs is not for the faint of heart. But I signed up for the long haul when I adopted him as s a youngster. And I’m one of the lucky ones. 13 and a half is a long life for a large Lab. It’s hard for me to admit, but in all honesty, I felt guilty when I sometimes thought about how much easier my life would be if I only had Gina to take care for. I craved our old lifestyle when Sanchez so willingly went for walks with us and enjoyed a very mobile lifestyle. On top of those feelings, I had some important trips coming up, and I didn’t know how I was going to leave Sanchez in someone else’s care, given his current state. I’ve been through it before, so I know how painful and simultaneously precious the end of life is with our beloved dogs. I don’t want to miss that time with Sanchez. And, I’d rather choose to be a week early on that decision than a day late. But, how could I make that decision based on my lifestyle needs and travel schedule? The truth is that caring for him in such a tender state has increased our bond and strengthened our relationship. It’s been hard, but it’s time that I wouldn’t trade for anything. I feel more connected to him than ever. Cathy advised me to take care of myself, take my trips, and say good-bye to Sanchez before I left, just in case he needed my permission to pass when I was gone. While she didn’t tell me that would happen, I actually felt somewhat relieved of responsibility knowing that I could leave him knowing that he would do what was best for him. Fortunately, Sanchez showed me that it’s just not his time yet. I’m very happy to report that he is on a complete trajectory of improved health. Not only were his lab results very encouraging, but he’s back to his normal weight again, getting out of the house more (as am I), going for short walks, asking for tummy rubs many times a day, giving kisses again, and chewing on dog bones (and even went digging for one outside). He’s now back to his old normal self. I’m eternally grateful for his recovery and renewed health. And, I’m well aware that every day with him is a gift. I know it’s only a matter of time before I have to re-consider both of our lifestyles if his health fails again. But, for now, he’s reminding me to be present and enjoy our time together. I even took him to the ocean this weekend and let him sniff everything in sight. I drove Sanchez to the ocean on Friday. It was our first trip there in awhile. He definitely is slowing down more now, and he wasn’t quite himself today, just slower and less engaged. It’s the first day in months that he didn’t ask for a tummy rub. But, his appetite was strong. So, we’ll see what tomorrow brings. Sanchez is doing better now. I realized Monday morning that it was his neck that was bothering him, from an old injury - slipped disc from 4 years ago. I got him to the vet today for an acupuncture treatment and he's now back to his old normal self. He’s quite the miracle dog! I have to agree that Sanchez, with Lisa's love and support, is doing remarkably well especially for a senior dog. Way to go, Sanchez and Lisa! I'm proud of you both.